What makes someone pick up a new book in a bookshop? Why that one? Is it the colour of the cover or the size or where it’s sitting on the shelf? Is it the title? I like titles. I’ve just read and reviewed ‘What Willow Knew’ by June Colbert. For me, that’s a title! It immediately had me wondering what it was that Willow knew, and why it mattered. I wonder when in the book-creation process this title came – whether it was the title that generated the story or whether the title was a afterwards thing. Was it agonising to find this fitting title or a natural thing that birthed easily? Willow is not the main character in this mystery, but she colours all that happens. I enjoyed the story, finding it difficult to put down. For me, sometimes the title come first, sometimes in the middle of writing and sometimes not until after the story is well-finished. If they work as well as this one does, then that’s a fine thing. Jan 26 is Australia Day. Around the country big events and small celebrate what it is to be Australian. There were award ceremonies, parties, a countdown of the 100 most popular songs in the country (which also included more than one party) and many other local events. Here, we were more low key. Our day started with a 6.30 am visit to Victoria Market. The Vic market is a great tradition. At this hour, some stall-holders are still getting their goods into order(the fruit and veg, deli and the like – the non-food stall-holders start later). Only the most serious of shoppers are nearly done, heading home to breakfast, special trolleys laden with the best. We start with a breakfast outside the deli hall. Breakfast done, we ‘do’ the deli section and then the meat hall (sometimes). Then it’s a gentle peruse through the fruit and veg, gathering produce all the way to our end point, the second coffee. From this vantage point we are able to watch the potato stall and various others at work. They are humourists, this population who rise in the dark, and I hope get some sleep in the afternoon. It’s nice to be leaving, our bags full, before movement in the aisles become slower than fudge. Once home and unpacked, it’s time for the beach. It’s going to be a fairly warm day and we hit the dog pool…a part of the beach with a natural pool that’s perfect for all. It’s a very social place, for the dogs that is. For one of our party – newly overcoming fear of dogs – the placid Irish Wolfhound and the bounding Labradors are almost too exciting. But here, dogs of all sorts with their no-less varied owners happily share the space. We lingered long. After lunch we visit our very new reinvented swimming pool. It’s a much grander affair than the old one. It has a much larger 25 m pool with room for lapswimmers, lessons and ‘general users’. There’s a large beach entry shallower pool and a smaller toddler pool. There’s room for everyone. We finished our day with a barbecue. I reckon that’s an okay kind of Australia Day. I enjoyed it. I found this building when I was walking around some inner suburban sidestreets. I walked past it several times and was stopped each time by the notion of confidence and permanence that the sign evoked. It wouldn’t happen today where businesses come and go and name change often. The designers/builders/occupants were sure enough of their business to set the name into the building. 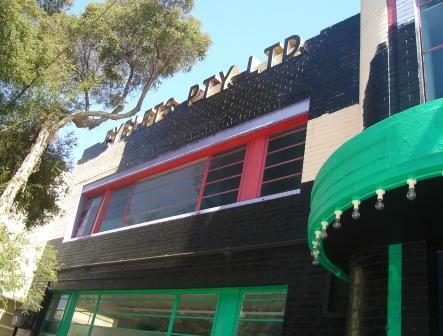 Of course this building is no longer home to makers of eyelets, it’s a dance studio. But it took me back to a time when a company could make just a single item and make a living. When I was taking the photos, I was stopped by a woman driving past. She asked me what I was taking the photo of and why. When I told her, she said that she also thought about the sign all the time, but had never got around to doing anything more. I kept taking photos and she drove off, only to reappear at the door of the building…where she worked. Who says no artists live here? In an earlier post, I spoke about this film and speculated that it felt like it had come from a book. I felt that there were things left out, or not communicated clearly. Well, I was right. About the book that is. I’m fully aware that it may well be my own limitations that prevented me getting what I wanted from the film. The book by Anna Gavalda is marvellous. All the questions I had after seeing the film were answered. Actions and decisions made sense. But there was more. There were other characters either absent or only very briefly alluded to, drawn in full colour. The main characters were rich and full and delightfully frustrating. I wanted to shake them, yell at them, hug them, cry for them, laugh with them. I couldn’t leave the characters behind when I put the book down and I couldn’t put the book down for long. I want to see the film again. I think this time I could appreciate what the film makers have done. I don’t pretend to be a film maker and I don’t pretend that I know how they could have made the film work for me first time around. Someone said that a screenwriter’s obligation is to stay true to the essence of a book brought to screen, not to reproduce the book. I get that, but to my mind they did stay close to the book. I won’t know until I see it again, if the clues were there and I just missed them. So if you get the chance, see the movie. But read the book first. There’s a restaurant/cafe not far from here that also doubles as an art gallery. The building it occupies was once a bank, then a ‘Sailor’s Rest’ and even features a chapel, complete with vaulted ceilings. There are two big paintings, one in the front section, the second in a chapel. The chapel one features a charcoal drawing on old pianola role paper. The one in the main part of the restaurant is painted on sheet music. Is it recycling? Or is it layering – giving an extra level of meaning to the work? I have no way of knowing really. But I liked the painting, so to me it doesn’t really matter. It opens the discussion about whether it is necessary to know the artist to understand the work fully, or whether the work must stand alone. My office is a shadow of its former self. The bookshelves are along the hallway, the cupboard and filing cabinet are elsewhere and even the pinboard and pictures are gone. There’s still a desk and the wallpaper but both will still be gone. It’s open and echo-ey. Over the past few months I’ve been trying to work out how to rework a novel and in the post-cluttered room, the answer came unbidden. A bit like the holiday brain really…so full of plans and parties that there is room for little clarity when it comes to writing. But now those parties are mostly behind us (leaving plenty of good memories of course) and there’s room for solutions. For the first time that I reopen the novel file, I know where I’m headed.